I tend to look at the ground while walking so I don’t trip and fall again. I seem to break bones easily these days! When I did stop one day and look up, the scene was breathtaking! I just stood there and took the time to stare at the leaves of many colors and the light dancing on and through them. 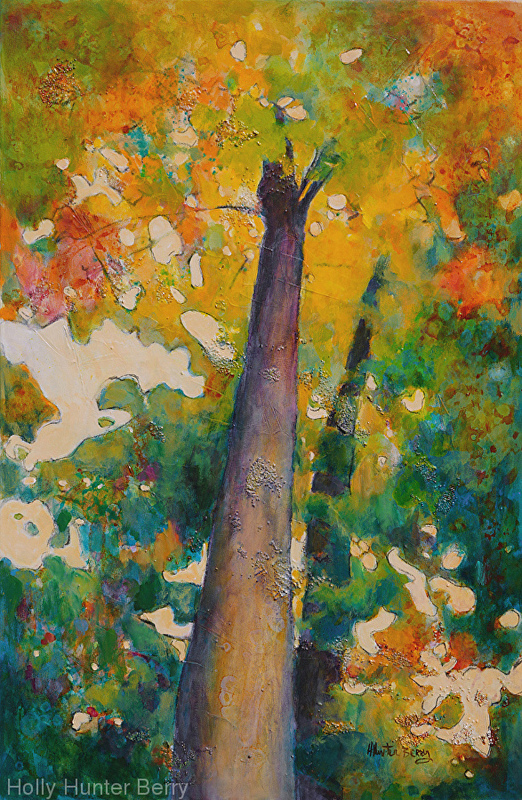 In my walk through life I’ve learned that my answers to questions come from above and so I created this painting, “One Answer” to illustrate that there is but one answer to my questions and it is to look up and listen to the Creator of all. Many people respond to this painting because of the contrast of colors and it’s drama. I hope this painting will be a blessing to anyone that takes a moment to look at it and allows it to tell you it’s message. Enjoy! Visit https://HollyHunterBerry.com to view more of my work.